You can learn a lot from a series of unfortunate events. Collapsed caves can leave entry holes on the surface that become hazards to local fauna. The image below is from inside a famous natural pitfall trap in Wyoming. The surface above is rather flat and prey running from a predator sometimes fall into this hole or prey smelling the decaying remains of dead accident victims may lean over too far for a closer look and fall in themselves. Over years, decades, and even tens of thousands of years, remains of animals and sediments in the trap accumulate preserving a chronology of historical events that we can read today. Such is the case of a natural pitfall trap in Spain. However, this one has a twist. This trap is so old that it has become completely filled with sediments and bones. People living in the area had no idea there has been a large pit there at all because it was filled prior to modern humans occupying the region. But some curious scientist found a cluster of fossils, which, upon further examination, they came to realize were the remains of an ancient natural pitfall trap. Since its discovery, field work at the site for more than 10 years has yielded more than 1800 fossil bones from at least 18 species of extinct large animals. The site represents one of the best sites for fossil carnivores in Europe because of the unique circumstances under which it is thought to have formed. Similar to my previous post on “fossil” caves in South Africa (The frequently overlooked geological context of hominid fossils) this site represents what was a extinct sinkhole of sorts. Similar pits that were simply a hidden hole that caused animals to accidentally fall in the pit are expected to contain the bones of large numbers of herbivores rather than carnivores. But this ancient pit had a large number of carnivores. Why? It seems that this pit had walls that were enticing to carnivores who thought they could get into the pit and get out with the probable reward of water and a meal. However, once in the pit they soon discovered that the walls could not be scaled thus sealing their fates. A figure from the supplements of the reference in this post. This is a diagram of a possible history of this cave/pit from the time it formed to its being completely filled. This pit was about 30 feet deep and the vast majority of the fossils are found in the lower parts of the filled material. Over time continual deposition of new sediment and unfortunate victims of falls and unwise predators resulted in filling of a pit that had started out at least 30 feet deep. Once filled with debris the contents of the pit were preserved through various forms of fossilization. Scientist have been excavating the pit by digging their own pit into the ancient pit sediments, revealing the past history of this site. The figure to the right shows a likely history of this pit. Thus far thousands of bones belonging to at least 18 different large species of mammals have been found in addition to many remains of smaller animals. All of the remains of mammals found thus far are of species that are extinct today. Among the remains there is an ancient horse species that stood at most four feet tall, several extinct rhinoceros species, a bear dog which was a bear sized animal that looked like a dog but also had bear-like features and was likely neither a bear nor a dog, several large cat species, an ancient hyena species and multiple other hoofed animals. I probably sound like a broken record at this point but context is critical when asking how a location like this fits into the young earth creationist’ (YEC) viewpoint. I expect that many YECs when told of these thousands of bones they will not be told about where the bones are found and how they may have been preserved. They may just believe that these were animals swept up in a large flood. For the typical YEC follower who does not have a working knowledge of geological processes this is understandable. But for the young-earth leaders such as those who work for Answers in Genesis or the Institute for Creation Research who are tasked with providing expert answers about how to interpret science within the young-age paradigm one expect more. It is especially troubling that these experts are often unaware, or at least seem uninformed, of the challenges that sites such as these present to their own theories. Conventional geological dating of these fossils tells us that they are about 10 million years ago with active collection of animals and filling of the cave having taken place over tens if not hundreds of thousands of years. This is obviously problematic for a young-earth paradigm in which all these fossils must have formed after a Noahic Flood which ended less than 4500 years ago. A depiction of the extinct bear dog (Amphicyon). This was one of 30 or more species of members of the bear-dog family that are all extinct. Bones of bear dogs were found in the lower levels of this cave deposit. Click on image for image credit. First, remember that these fossils are found in sediments that were deposited inside an open pit and cave system. Where did the cave come from in the first place? The layers in which the cave originally formed are considered to be of Miocene age by geologists and most creationist writers accept that these rock layers were formed after a global flood rather than by a global flood. So the deposits, which contain various types of rock representing unique depositional environments must have been laid down and turned to rock prior to the dissolution of that same rock to form the cave. The cave then had to suffer a collapse resulting the creation of a pitfall trap. Only then could that pit begin to collect animals and preserve their remains. Over time the entire 30 foot-deep cavern had to fill up and its contents be fossilized. When considering the chronology of this sequence one also has to account for the fact that people have lived in this region for 3000 years or more after the this pit had already been completely filled. Remains of this extinct horse, a Hipparion, were found in the cave deposits. This horse had 3 toes and was about 4-5 feet tall. It boggles the mind to imagine how one might hypothesize that all of these events could have taken place in just the past 4000 years. Even had the pit formed 4000 years ago, how did hundreds of carnivores become trapped in such a short period of time? There are sediments separating many of the bones. These sediments are best interpreted to represent deposits between times when animals died and were slowly buried. These processes of sediment deposition and accidental falls would have taken time. At most a few animals per year would get trapped. But at that rate it would take tens of thousands of years for the lower reaches of the pit to be filled with sediments. Remains of this extinct deer-like animal were found in the deposits. Click for image source. On top of all of the geological context we have the types of fossils found here that must be considered. They are all extinct species of animals and most represent types of animals that do not live anywhere in Europe today. There are deer and horse-like creatures but not a single species, or even ones closely related, that we find today. Relating this back to some of my previous posts we can see some member of the early horse succession here (A horse is a horse of course: unless it isn’t a horse) including a small 3-toed “primitive horse.” The “bear dog” is a huge beast that shares features similar to bears and dogs. Creationist’s today believe that this was a unique “kind” of carnivore that existed as at least 50 different species within the past 4500 years but all those species are extinct today. The picture we have painted for us by this preserved cave is a picture of an entire ecosystem that is quite foreign to anything that we would recognize today and yet all of these animals would—according to YEC chronology—must have lived in this area of Spain after a global flood less than 4500 years ago. This timeline, as I’ve stated many time in other places, strains credulity. Unfortunately, fossil locations such as this one will either not be mentioned in the creationist literature or will be written about vaguely as being easily explained as an ice-age event that took place over just a few hundred years but the specific geological context of the fossils will not be mentioned. It is a hear-no-evil see-no-evil approach that has served Ham and his colleagues well for a long time. I don’t expect that will change anytime soon but I do feel for Christians that have grown up following YEC literature and are then exposed to places like this fossil site only to discover that creationist’ geology has ill-equipped them to explain the origin of these fossils. Lets focus on the biology in these traps. The pit could have been a perfect Darwin trap, demonstrting gradual changes and transitions of beardogs into dogbears and dogs and bears. But it is not. As all other pits, including Labreea tar pit is. They disporve Darwinian graduallism and are evidene of saltational organismal changes. How it works can be read in my books. You linked this article because it supposed to prove something. What should this data prove? That YEC is wrong? Looking at the data, I see extinct animals trapped that are all related to modern animals, but not in a gradual way. Some, like the musk deer could be even the same or slightly differen. What does it mean? That we are looking at modern extinct organims. The biological process of change is non-darwinian, does not need long ages and is explained by genome shuffling (proved by the karyotypes of extant organism). It provides a rapid speciation model for YEC, so what is the problem? In fact, you show evidence completely in accord with YEC. You’ve proven NH’s point exactly, by cherry-picking a single issue (the biology) that doesn’t per se disprove YEC and ignoring all the others (sedimentation-erosion-sedimentation, intermittent sedimentation, rate of trapping, etc.) that do. A “handwavy clause that do[esn’t] account for the facts reported” is a perfect description of what you’ve posted. A quick note: the ‘deer-like creature’ is Micromeryx, a moschid, not a deer. Moschids (today’s musk “deer”) are a family of hornless ruminants (Moschidae) found today in Asia, and molecular evidence shows that they are more closely related to bovids (i.e., antelope and cattle) than to deer. Bear dogs (family Amphicyonidae) are known from the late Eocene to the Pliocene from both Eurasia, Africa, and North America. A highly successful radiation (that also included many smaller, more dog-like species). But now completely extinct. A bit of a problem for the post-flood diversification scenario, as you note. Hipparions were not “primitive horses”, although the picture may make them look like that! They were the major tribe (in terms of number of species/geographic distribution) in the Miocene-Recent equid subfamily Equinae. Another tribe, the Equini, became single-toed and survived to the present day, but the hipparions survived until around 1 Ma, and many species were as large as modern horses. 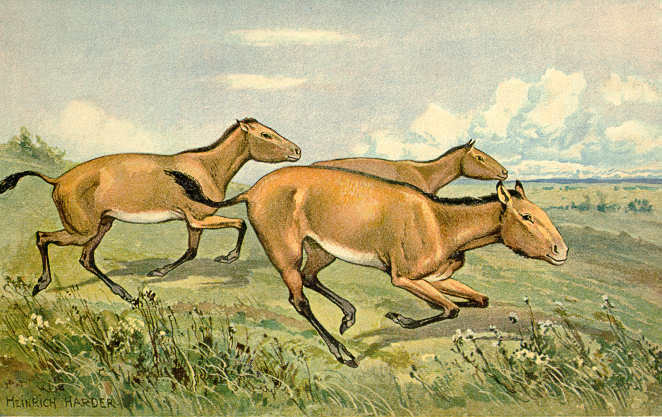 So, they were cousins to extant equids, not more primitive relatives. The musk deer in Asia differ genetically at the karzotype level, with chromosome number ranging from 8 to 48. The 3D orientation of the genome in the nucleus is the 3D construction plan of the organism through position and spatial effects of gene control. TEs link the bauplan together via Hoogsteen basepairing with lncRNAs. The genome is simply reshuffled and this determines how the bauplan is executed. No new genes required and this type of evoltion is instant, one-few generation(s). This is the new standard to understand biological changes. It suits both OEC and YEC. Thanks for the comment. Always great to have an expert give us some more detail and making sure I am keeping the information correct. Interesting bone collection pits, NH. It would have been an excellent proof of gradual evolution, if it were the mechanism by which biological speciation occurred. The pile of bones simply demonstrate that Darwinian gradualism is false. Biological system like the animals found in the pits rely on information. Information is inherently unstable, so the pits cannot be older than a few 10-100 thousands of years. That’s an oxymoron. As Christine explained, they are not simply trivial variations of modern animals. Moreover, why do we find bear dogs and similar forms only in Cenozoic strata? If they all quickly evolved from some basal form after the Flood in a few hundred years, why would then not have done so before the Flood, and therefore appear as fossils before the Flood? This brings us back to the question of why there are zero pre-Cenozoic fossils of any large modern mammals. No bears, dogs, beardogs, horses, rhinos, hippos, cattle, deer, sloths, pigs, elephants, whales, apes, humans, etc, etc. No matter which of them you think were around before the Flood (at least some had to be, and thus often found as pre-Cenozoic fossils), especially since millions of dinosaurs, pterosaurs, mososaurs, etc. were. You’ve been asked about this several times before, without any reply. Hardly. 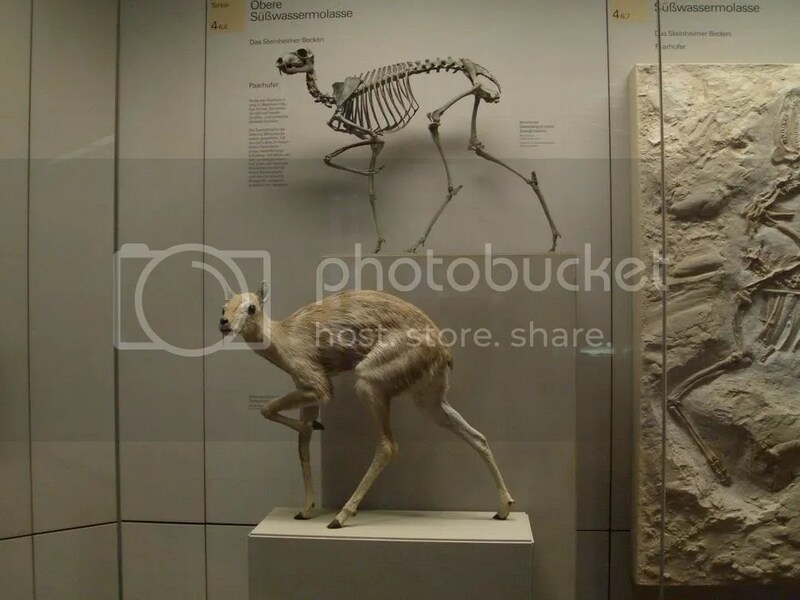 Besides the misunderstandings about the animals in question that Christine pointed out, you are ignoring all the serious geologic problems the site presents for YECism. I’m not surprised though, since you’ve consistently ignored our questions about geology and the fossil record before. Frankly, you seem to know virtually nothing about those fields, which is a major problem for someone trying to turn them on their heads. You asked me to read some YEC books (even though I’ve read shelves full of them), so please take your own medicine and read some mainstream books and papers on geology and paleontology. Hardly. Even by your model, beardogs evolved from other animals, so either way there had to be intermediates, even though not all would have fossilized. Moreover, it is far more plausible for it to happen over millions of years than a few hundred or few thousand years. The first claim is so vague it is essentially meaningless, so the second certainly does not follow from it. Care to show any data and calculations, or did you just pull the numbers out of thin air? Even the lower range is older than what most YECs allow, but far younger than what multiple independent dating methods show. So how old do you think the bones are, or the earth is, and on what evidence? Can you describe even one reliable dating method that shows the earth to be only thousands or even tens of thousands of years old? Do you, like ICR’s RATE project authors, believe that when confronted with compelling contrary evidence, it’s fine to just invent multiple ad hoc miracles to explain it? Who determined whether these are species? In my opinion they simply derived from one baranome in single speciation events through genome shuffling. Maybe the organisms produced gametes in a semimeiotic way. It would require a few generation to get 50 different karyotypes and thus different fenotypes. The people who determined that amphicyonids are a separate family within the order Carnivora are competent anatomists. Features of the auditory bulla are distinctive between different carnivoran families, and amphicyonids are different from any extant families. I note that you are now claiming that the Order Carnivora is a single ‘kind’. Why not just call all placental mammals a single ‘kind’? That would fit well with your declaration that all marsupials are a single ‘kind’. Maybe aliens brought them down to earth and sculptured them to look like a mixture between bears and dogs. So, you do not know what semimeoisis is, I presume. Semimeoisis happens sometimes in the formation of gametes. The segregation of the chomosomes is then in such a way that novel genomes (karyotypes) form instantly and the next generation inherits a novel karyotype and sometimes a completely novel phenotype. It is saltantional evolution (read Dr Davisons manifesto…he was no YEC but an OEC by the way). Due to such saltational mechanism (chromotripsis is the left over of the saltational process and can be observed when the control over it disappears, e.g. in some cancer cellls), we can simply not determine the border of the created kinds from fossil remains. We can only determine this border using the genetic information content of the whole genome (the baranome), as I published 10 years ago. I read about it in Davison’s manifesto: it’s advanced as a term for meoisis that is presumed to have halted after the first chromosomal division. If you google the term, almost all the results that are returned are those of Davison’s writings, including an article written by a geneticist that specifically refutes his notions*. It’s a term of limited use, possibly invented by Davison himself (I can find no other reliable source for this term), with no evidence to support the use to which Davison ascribes to it, the proposal that new taxa arise as ‘hopeful monsters’. As so much in Davison’s manifesto is either factually wrong or at least 50 years out of date I don’t consider him to be a reliable source of biological insights. For those readers without easy access to online journals: this is a letter to the editor, in Journal of Theoretical Biology 1986, by M. Maguire at the University of Texas. This are some relevant section from the paper. “The perceived advantage of such a system (semimeiosis) seems to be that a Goldschmidtian ‘hopeful monster’, presumably made possible only by occasional chromosome rearrangement, could be rendered homozygous immediately, hence macroevolution”. Maguire then spends several paragraphs explaining why (3) does not actually help Davison’s case. So, yes, now I do know what semimeiosis means. The question is, do you? By not referring to Davisons refutation, you are trying to bias the discussion. Referring to 1947 papers is also not very helpful in the 21st century. So, the semimeiosis is still a workable hypothesis for rapid speciation. Of course there are many more mechanisms, such as the recently described chromotripsis. Neither you nor Davison have demonstrated that these mechanisms are common or significant in evolution. Meanwhile, you both (like many YECs) dismiss the role of natural selection, even tho it is well demonstrated, and without it, you have no way to preserve and pass along any adaptive accidents of your other mechanisms. I would agree with that. However, that is the paper that Davison himself cites heavily in support of his own argument, both in his original paper and in his rebuttal. Maguire is merely noting his sources. Yeah, one thing that immediately struck me about Davison is that almost all his sources are decades old or older. He even neglects important work on things like Punc Eq, the K-T impact, despite their obvious relevance to some of the things he discusses (like slatation and extinctions). In view of this and all the other problems in his “manifesto,” how Peer can regard him as a crack researcher is beyond me. Although yesterday I was reluctant to say much more about the problems in Davison’s “manifesto”, Peers comments prompt me to go ahead and outline some of those I found. Again, to address them all would practically take a book. First, Davison fosters many false dichotomies. Even if “semi-meiosus” sometimes was involved in evolution, it doesn’t mean sexual reproduction wasn’t involved or important, especially in vertebrate groups. Indeed, he ignores extensive fossil evidence that vertebrates have reproduced sexually for tens of millions of years. Oddly, he does not even say when organisms evolved sexual reproduction, or for what purpose, if as he claims it is anti-adaptive and suppresses variation. Actually, it allows for additional variations and genetic combinations. He also suggests that conventional science claims evolution requires sexual reproduction, which is untrue. Whether mutations occur in sexual or asexually produced offspring or gametes, natural selection can act on them to foster evolution. Davison clams that natural selection has no role in evolution other than to suppress variation, despite lots of observational and experimental evidence that it can preserve and spread adaptive genetic changes, however they occur. Dismissing any significant role of natural selection or point mutations, he proposes huge, sudden chromosomal changes, but without any means of directing or controlling them, or any explanation as to why they would be preserved and spread. At times he seems to hint that divine guidace or creation is involved, but he does not clarify this, or whether he thinks it’s all “frontloaded” or due to periodic interventions (progressive creation). He talks about the inability of natural selection to produce “progressive” evolution or “advancement. : However, mainstream scientists to not regard evolution as producing “progress” – just adaptations, Like many YECs, he often depicts “Darwinism” as an entirely random or “mere chance” process, even though he must know that natural selection is not an entirely random process, even though it often acts on random mutations. Essentially, Davison tries to revive a form of Goldschmidt’s “hopeful monster” theory, suggesting that large chromosome-level mutations, “semi-meiosis” and/or asexual reproduction can and usually did produce instant species and even instant general and families. He even quotes the old line about a bird hatching from a reptile egg, as if this kind of thing was feasible and routine in evolution. But this doesn’t make any genetic or common sense, since again, he has no mechanism to direct or coordinate all the genes required to do this, or to preserve and spread any such monsters, on the highly unlikely chance they’d be viable and adaptive. Without natural selection, at times he seems to hint that the missing agency might be some divinely creative act or process, but fails to clarify this. He does agree that Lamarckism has no significant role in evolution, and “cannot be given serious consideration,”–the exact opposite of Peer’s bold claim that all of biology is Lamarckian. Besides the examples Christine noted, Davison makes many unfounded comments about major trends and patterns in the fossil record. His depiction of horse evolution (with associated diagram) is very oversimplified, suggesting a ladder like form of evolution YECs used to ridicule “evolutionists” over. However, even it shows intermediate forms, not hopeful monsters. His comments about trends in body size and offspring numbers are also simplistic and undermined by many counter examples. His suggestion that large animals go extinct quickly is especially odd in view of the fact that some of the largest (sauropods, carnosaurs, mososaurs) persisted for tens of millions of years, and that many went extinct not due to genetic problems or deficiencies. He seems oblivious to the evidence for a large asteroid impact that evidently caused or at least contributed to the massive K-T extinction. Nor, curiously, does he mention any recent global Flood, or how it would affect his radical ideas on evolution and extinction. Even if some of the listed examples are not directly transitional or ancestral to modern species, they are still intermediate forms, occurring in expected geologic horizons that are entirely compatible with evolution, but contradict expectations of YECism and hopeful monster ideas. Davison apparently fails to consider that one reason we don’t have even more intermediates is that by all evidence speciation often takes place in small and/or isolated populations (and again, over relatively short geologic time spans), explaining why they are less likely on average to leave fossils than large, stable populations persisting for longer spans. But again, despite all this, many of intermediate forms have been documented, with new ones turning up on a fairly regular basis (witness Tiktaalik, all the feathered dinos from China, etc). Another unfounded claim of Davison is that evolution has entirely “ceased.” He claims there is no evidence for any evolution in the last several million years or more, and virtually no mammal evolution for about 40 million years, which is contradicted many fossil finds (including various hominids, cetaceans, elephants and kin, etc). I suspect Christine could address this further, if she feels it worth the time to do so. Despite all the problems in Davison’s claims and approach, to his credit he does appear to accept conventional evolutionary timescales. Ironically, if he were correct that no evolution has occurred for millions of years, it is the exact opposite of what YECs need for hyper-rapid post-Flood speciation. Peer, in view of that and all the other problems, including Davison’s acceptance of an old earth, and his rejection of Lamarckism, which you claim is central to biology, why do you seem to revere him as a one of your heroes, often depicting him as a brilliant scientist, and citing him as an authoritative source? I posted about 10 rebuttals and responses to questions appearing here and in other threads. They did not appear on line. Is something wrong with the communication? PB, You are definitely welcome here. I am just lagging behind with so many comments. I just went through and found several that I had not approved as yet and approved them. What I have just done is turn off moderation so that your comments will appear without any wait at all. Thee is no evidence chromothripsis (note spelling: https://en.wikipedia.org/wiki/Chromothripsis) is in any way related to meiosis. “We can only determine this border using the genetic information content of the whole genome (the baranome)” . That is, we have to look at the whole genome of all species to find the boundaries between kinds. How do we know from wholes genomes where the boundaries between kinds could be? Peer, if you were given just DNA data without knowing what animals the DNA comes from, how are you going to find the boundaries between kinds? And?? It is a remnant of ancient genome remodelling mechanism, which can become reactivated in cancer cells. Normally these programs are silent, surpressed. The fact that they still exist in the genomes shows that in the past rapid speciation mechanism were possible. Instead of an answer to a major queston – how do you recognizes the boundaries between kinds on the basis of DNA – Peer comes back with assertion about a minor point, without any evidence wahtsoever. I asked about an example of frontloading with a prediction about what the animal is like. I asked here about how you want to distinguish and recocnize kinds on the basis of their DNA, Peer, yoy state: “We can only determine this border using the genetic information content of the whole genome (the baranome)” Now the task for you is to do that and give an example. Those must be major points to you, and you should have the answer ready. To Peter’s comment “There is no evidence chromothripsis (note spelling: https://en.wikipedia.org/wiki/Chromothripsis) is in any way related to meiosis.” It is a remnant of ancient genome remodelling mechanism, which can become reactivated in cancer cells. Normally these programs are silent, surpressed. The fact that they still exist in the genomes shows that in the past rapid speciation mechanism were possible. Your last comment does not at all follow from the preceding ones. Just because something causes massive genetic changes, doesn’t make it a viable “speciation mechanism.” As the Wiki article Peter referred to indicates, chromothripsis involves the sudden rearrangement of tens to thousands of chromosome fragments, and thus is associated with cancer and congenital diseases. So on what basis do you claim it an “ancient modeling” mechanism, and how is it helpful to your model, especially since you reject the adaptive role of natural selection? Without NS, even on the extremely remote chance chromothripsis will produce any kind of useful result or “hopeful monster” it’s a dead end. Moreover, the more massive any sudden change, the less likely it is going to be helpful or “hopeful”, even with NS. Often you misuse the term “speciation mechanism” to describe some generally random, massive, and/or destructuve process or event, without any means to make it useful or adaptive. In short, you don’t have an speciation mechanism, your have generally disruptive and destructive phenomena lacking a speciation mechanism. Also, the article indicates that chromothripsis has been found to occur during the development of tumors, apparently as a result of the breakdown in DNA repair mechanisms. That hardly sounds like an “ancient modeling” process. Even if the phenomena involves any latent genes that occasionally get reactivated, it doesn’t mean they were useful in the past, for speciation or anything else. If they are normally inactive now, the likely reason is that they were harmful mutations. Otherwise, why would their re-activation be associated with disease and cancer? By indicator genes (as discussed in my book). How do you identify indicator genes? Could you give an example, for instance for the kinds within the order Carnivora? Could you specify indicator genes for the bear family (usually described as a kind), and tell why the giant panda is a bear and the red panda is no? Peer, could you comment on my comment “Peter January 29, 2019 at 3:44 am under’ Horses in the Bible Contradict Ken Ham’s Hyper-evolution Narrative’? In my closing question, I assumed the answer was implied by my other posts. That is, the likely reason Peer doesn’t recognize many of the problems in Davison’s manifesto, especially about the fossil record, is that Peer seems to have gleaned most of his ideas and limited knowledge on that topic from YEC sources. That’s why I recommended Art Strahler’s book Science and Earth History. There are many other books and articles I could recommend (besides the many fine articles by Joel in this blog), including ones by Christian authors addressing various aspects of geology and the fossil record, such as Davis Young, Ken Miller, Glenn Morton, Kevin Nelstead (GeoChristian.com) who sometimes posts here, and the late Dan Wonderly. These and other such sources (including many fine articles by the ASA and BioLogos) are linked near the end of my Paluxy menu. By the way Peer, did you get a chance to read my article on Trace Fossils? You indicate that you would send me a ecopy of your book. Did you get a chance to do that? Thanks. Maybe I am beating a dead horse (or rhino), but other problems in Davison’s claims relate to his curious neglect of the K-T asteroid impact. Not only does it explain the extinction of dinosaurs and many other creatures which he implies cannot be explained except their being doomed genetically (despite having thrived and diversified for millions of years), it also refutes his claim that there is no logical explanation (other than hopeful monsters) to explain the rapid diversification of mammals in the Cenozoic. With the sudden demise of thousands of species of dinosaurs, pterosaurs, sea-going reptiles at the K-T event, many new and large niches were opened up for mammals to exploit. One has to wonder how he could be unaware of these widely discussed aspects of Earth history, or ignore them if he was aware of them. 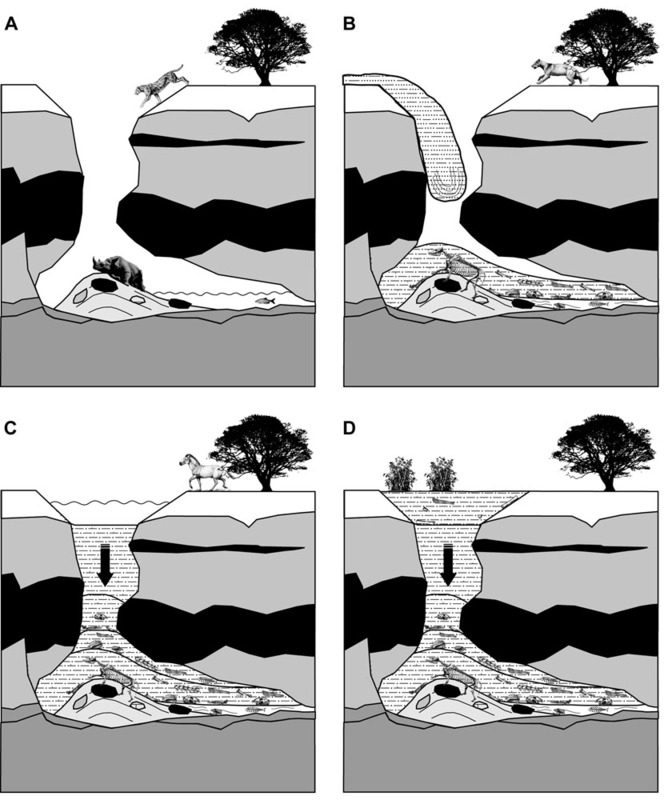 This relates to yet another problem in Davison’s claims, namely his misrepresentation of “uniformitarianism.” He implies that conventional scientists only allow gradual geologic processes, even though modern geologists fully accept that catastrophic events such as the K-T impact did sometimes occur, and had major impacts on evolution. Making matters worse, he asks “Can uniformitarianism be applied to living systems?” (as if this were a common mainstream claim). He says the answer is a resounding no, since “An amoeba grows and then stops to divide…”, neither of which has nothing to do with uniformitarianism, or the price of rice in China. What controls or directs this shuffling to instantly produce a viable new species? With natural selection acting on mutations over time, there is a logical reason why adaptations take place, and it’s supported with observational evidence. This not to deny that chromosomal mutations and changes do not occur or have a role in evolution, but how are sudden, massive chromosomal changes of the sort you and Davison talk about (“hopeful monsters”) going to be the main driver of evolution, especially without natural selection? Even if you believe these changes were all “frontloaded” during the original divine creation there has to be some mechanism to trigger them when needed for a changing environment, and to select and pass them along, so why discount the role of natural selection, even in your own model? Jeanson and others havesometimes cited natural selection is a factor or even major one, even tho others at AIG say virtually the opposite. Are you afraid that if you gave even a little credit to natural selection, it would make it harder to explain why there are any limits to change? But that seems almost moot, since you’ve already implied that Geneis kinds can be as broad as orders or classes. Speakng of which, you’ve also never answered the question about why a dove and raven would be different kinds, but animals as different as T.rex and owls are the same kind. Or why humans and chimps are different kinds, while animals as different as horses and rhinos are the same kind (or kangaroos and sugar gliders), are the same kind. No need for consistency? there is no problem with this and YEC. This is a post flood event. Say about 2000BC.Easily great numbers of creatures would fall in as great numbers lived in the area. our present poverty of fauna is unnatural. bears and dogs are the same kind. a dog is just a small bear. Its just a diversity in a spectrum within a kind. these caeves are cool as they show the world before its decay. The kinds are not extinct but only the types/species within. Robert, What do you mean the world before its decay? You just said it was a post flood event. At any rate, you are ignoring the serious geologic problems the cave presents for your YECism, including Joel’s question about how the cave even got there. You also seem to miss the problems presented by the many non-animal species animals in it. In case you missed that, they include a small 3-toed horse, several rhino species, a hyena, multiple cats, deer, and several other species of hoofed animals. How could those all be the same “kind?” Please tell us on what genetic or anatomic basis you conclude that. Your comment that “a dog is just a small bear” is so lame, it destroyed any vestige of credibility you have left. If animals that different are the same kind, why are humans, chimps, and other great apes not the same kind? Why are doves and ravens not the same kind? The geology things are other subjects. A cave origin is very common. i understand the diversity of critters and never said they were one kind. they just fell in or something. Bears and dogs are not different. they are minor variations of the same kind. Your dog is just a small mobile bear. likewise these bear-dogs were just types that had some bear or dog traits. human/chimp likeness is another issue. yes doves/ravens are different as they were kinds on the ark. yet they are quite different. However a kIND would include bears, nwolves, probably seals, and possibly some so called dinosaurs not misidentified. like those in the reptile-mammal transition they talk about and so on. The real world is one where a kind had a hugh spectrum of diversity. The present world is one of poverity. So looking at bears and wolves one is looking at the surviors and the most general in appetite. yet it is wrong to define them , or sample, on the survivors. Its a skewed result that would deceive. the fossil record, still inperfect, shows the original world, after the flood, better. The geology of the site (and the rest of the rock record) is all part of what you need to deal with, if you want a sensible YEC model. Caves may be common, but you have limited time to explain how this one formed, and all the rest of the issues Joel raised. You have not even begun to make sense of the animals at the site, and suggesting that bear dogs, bears,and dogs are just minor variations of the same kind, and throwing in wolves, seals, and even some dinosaurs, does not help. In fact, it’s ludicrous, for reasons not worth my time to explain. At any rate, given all the animals you lump together in a kind, please tell us how many vertebrate kinds there were, what they were, and how you distinguish them. On the basis of “general appetite”, whatever that means? You say the fossil record shows the original world after the flood, but most YECs claim the vast majority of fossils (at least before the Cenozoic) were deposited during the Flood. This may seem inconsistent with my previous comments, but it’s hard to resist saying a little more. It’s an issue you have to deal with, if you want to be consistent. You say genetics don’t matter and it;s all based on anatomy. So please tell us, on what anatomic basis do you consider bears, dogs, and seals the same kind, but consider humans and chimps different kinds? That’s hardly a scientific answer, and doesn’t begin to address the inconsistencies. How are doves and ravens more alike than bears and seals? According to Peer’s sources, Canis familiaris has 453 unique miRNAs. So it has to be a unique creation, unrelated to bears. Peer is starting to talk about indicator genes defining a kind. If Canis familliaris has 453 unique miRNAs, miRNA is not suitable for finding the boundaries of kinds. Christine. Genes should not be the trail to biological relationship. It should be anatomical and morphology likeness. A wolf is very clearly, to me just a smaller faster bear. A bear is a bigger fox. A bear-dog in the fossils is just another type. A richer world with more diversity in bodyplans. We now only have the runts of the litter left. Responsible biologists look at both when studying relationships, as well as any other pertinent data. “To me” seems to be the operative term there. What you say is nonsense to any knowledgeable biologist, or even the average middle-school biology student. And why would animals as different as bears, dogs, seals, and wolves all be the same kind, but bear-dogs be their own kind? Never mind. If you’re going to make such outlandish claims, while entirely ignoring genetics, and showing virtually no knowledge of geology or the fossil record, it’s hardly worth discussing further. Perhaps I’d change my mind if you showed the slightest desire or willingness to learn a few things from those who know more about these subjects, but so far you haven’t. We all should learn from those who know better. bear dogs would be in the same kind as Seals, wolves, etc etc. That was my point. We do now only have the most general and smallest examples of the KIND spectrums that once lived. Yes whales seems to still be the biggest but thats a special case. On land only the runts still are around. its wrong to sample or define kinds/orders of creatures but the ones alive today. Wolves live on the run even if a bear could outrun it in a dash. The wolf is made to cover ground quick all day long. Geology should not be important to biology science. Another problem with evolutionisms credibility. Robert: We all should learn from those who know better. bear dogs would be in the same kind as Seals, wolves, etc etc. That was my point. I got your point, which is why I called it ludicrous. I usually try to avoid terms like that, but in cases like this, I don’t know what else to call it. So far you’ve presented no real evidence, just outlandish assertions and speculations. Who are all these people who supposedly “know better” and support your odd ideas about “kinds”? Even among YECs, I don’t know any except (to some extent) Peer. I would not call animals like elephants, rhinos, hippos, giraffes, moose, “runts.” Even if the average size of modern animals is smaller than those tens of millions of years ago, there are reasons that have nothing to do with YECism, including the K-T extinction that wiped out all dinosaurs (except birds), pterosaurs, and most other large animals. Speaking of which, do you not think any late-Cretaceous impact happened? Even if you reject mainstream dating, when do you think it occurred in relation to the Flood, and what impact you believe it had? . Just the opposite. It’s comments like that which further damage YEC credibility, or at least your own. Anyone sincerely seeking the truth about evolution and earth history will try to learn as much as possible from all relevant fields, including geology and paleontology (the latter being the study of fossils and prehistoric life, which is essentially a combination of biology and geology). If you still insist on ignoring all the wonderful things these fields can teach us, especially in combination (with the K-T extinction being a good example), and instead only focus on your own narrow interests, it’s no wonder you have so many outlandish ideas, including ones that would make even most YECs cringe. That’s why (no offense) when I started reading your comments in these and other blogs, including gems like “This YEC creationist says there is not and has never been a thing or process called science.” I wondered if you were even on the level, or just spoofing. I’m still not entirely sure. Geology has nothing to do with biology hypothesis on origins. its not a tag team. thats just desperate evolutionism trying to make its case on non biological evidence BECAUSE it can’t make the case on biological evidence. The k-t line is just the flood line. Fossils below are from the single flood year. above are later events. Yes all creatures were destroyed and we find them ONLY because of a unique mechanism for their fossilization. instant smothering by sediment and pressure. I don’t agree there were dinosaurs. this was a poorly done classification in the 1800’s. these critters are just within the KINDS that exised and still do. YES i think the theropod ones etc are just flightless ground birds in a spectrum of diversity. Not that birds are dinosaurs. its a funny switherroo they do. Yet more research will prove theropods are just birds I predict. Robert, these are all uninformed opinions of yours without providing outside references that support your claims. When one says that everyone else in the world is wrong it is up to that person to provide the evidence. This is a lot of words that have little meaning as they are now. The problem is, not only does the subject of origins concern many fields besides biology, but even your biological claims are loopy and unsupported. Right, it;s not a tag team, and this isn’t a wrestling match. A sincere truth seeker is willing and eager to explore all relevant evidence on a topic, and to receive input and corrections from others. Clearly you’re not. You talk about “biological evidence,” but instead of providing it, or directly answering our questions, you repeatedly spout outlandish claims and speculations. I’ve tried to be patient, but I see little hope that you will change your ways, so I think ‘m done with you. Robert writes: “I don’t agree there were dinosaurs. this was a poorly done classification in the 1800’s. I tried to resist engaging you further, but this claim is too rich and funny not to. Even if your claims about theropods were true, and they’re demonstrably not, many dinosaurs were not theropods. Even most 10 year olds (and YECs) know this and can rattle off examples. Have you never heard, for example, of steogsaurs, sauropods, ankylosaurs, hadrosaurs, and ceratopsians (Triceratops and kin)? Please tell us what existing kinds those dinosaurs belong to. Robert: “Yet more research will prove theropods are just birds I predict. You have it backwards. By all evidence all birds are theropods, but not all theropods are birds. Lots of research has already been done that shows this. Clearly you have virtually no knowledge of fossils and prehistoric life. Please do more reading on these subjects before embarrassing yourself further here. As opposed to irregular animals? “with some adaptation? If you’re suggesting dinosaurs evolved from different “kinds” that would be called evolution. Seems like you base your ideas on vague and faulty recollections of things you heard someone say, or superficial skimming of YEC or popular-level material. Why don’t you do some actual reading of scientific literature and learn a little about these subjects, instead of repeatedly displaying your profound ignorance of them? Robert, even if you hadn’t stated elsewhere your opinion that the fields of biology, palaeontology and geology have no bearing on each other, and implied that evidence from any of these fields of study is of no value in helping humans understand the history of this planet and the living organisms on it, this claim of yours would amply demonstrate the depths of your ignorance, and your indifference to truth and logic. It is as absurd as if you were to cheerfully assert that William the Conqueror defeated Charles I at the Battle of Waterloo. It makes no sense whatsoever in terms of even a Young Earth Creationist narrative. If the K-T geological boundary marked the point of your biblical global Flood, as described in Genesis, when supposedly all humans bar Noah and his family were wiped off the face of the earth, along with all terrestrial animals and birds bar those on the Ark, why do you imagine it is that there are absolutely no fossils of humans, or any other modern mammal family – no apes or monkeys, no dogs, bears, horses, rabbits, kangaroos – in any rocks BELOW the KT boundary, or immediately ABOVE the boundary? There are plenty of fossils from earlier geological periods – the weird and wonderful creatures of the Burgess Shale, the trilobites, ammonites, plesiosaurs and ancient fish of Dorset’s Jurassic Coast, and on land the giant dinosaurs you claim were actually birds (or possibly egg laying rhinos), and flying reptiles, and mammals of the approximate size and apparently similar life style to modern tree shrews. No bigger mammals.And no humans, even though the whole purpose of the Flood was supposedly to wipe them out. And no human fossils in the rock strata immediately ABOVE the KT boundary, either. Or ravens or doves or sheep (or goats or cows or whatever other animal YECS imagine it was that according to Genesis Abel farmed and made a sacrifice of to the Lord) for that matter. There is no fossil trace, IOW, of any humans, or any of these other creatures mentioned in Genesis as existing before the Flood or at the time of the Flood, to be then wiped out globally except for their representatives on the Ark, having existed either BEFORE the KT boundary, or for millions of years after it, let alone of any of them dying in a flood or any other way at the time of the KT extinction event. Good points Sally. Also, as has pointed out before, YECs who suggest the end of the Flood was at the K-T (now called K-Pg) boundary have other serious problems as well. For one, it contradicts their claim that fossils in general require rapid and violent burial, indicting a violent global Flood, since millions of fossils in numerous strata occur above the K-pg boundary. On top of all this are the major patterns of fossil succession for countless groups of fossil plants and animals, many intermediate forms found at expected geologic horizons, and lots of corresponding radiometric dating evidence, all of which strongly supports evolution and an old earth, and flies in the face of YECism. Amazingly, many YECs still have the audacity to say the fossil record supports their view. Really? The largest animal that ever lived is still with us (the Blue Whale). What litter is it the runt of? Peer is starting to talk about indicator genes as useful for finding the boundaries between kinds. If Canis familiaris has 453 unique miRNAs, either miRNAs are not suitable for defining kinds, or this species has to be a unique creation. If miRNAs are indicator genes, the ‘dog kind’ means the species Canis familaris (domestic dog) not ‘about the family Canidae’. Robert, I meant non-modern, not non-animal species. i have to get more sleep! Robert (or indeed Peer or any other YEC who happens to be following these threads) I am waiting with eager anticipation for you to explain on what biological grounds you assign the raven and the dove to different kinds while lumping bears, dogs and seals Into a single kind, and marsupials as different from each other as the red kangaroo, the koala, the recently extinct Tasmanian “wolf” and the sugar glider into another single kind. My own formal science education ceased when I was fifteen, and you, Robert, appear (excuse me) to have still less, and have written scathingly about science, but elementary observation, without any need for either genetics or anatomical study, is enough to convince me that the raven and dove are far closer in every way than the dog and the seal, let alone the kangaroo and the sugar glider. Indeed, I’m pretty sure that my great nephew, at only fifteen MONTHS, could do as much. (Having learned to pick out a magpie in a picture book, he quite spontaneously called out “magpie” when he saw one in the park, and in a museum, when we adults were admiring quite other mammalian exhibits, pointed to silent footage on an overhead screen I hadn’t even noticed and called out “shark”, which indeed it was – a great white.) Admittedly, based on film footage only, I dare say he’d consider the Tasmanian wolf a sort of dog, but that’s an error that an intelligent adult might also make in the absence of any anatomical examination to reveal it as a marsupial. So here’s the challenge – explain,without recourse to the bible, in terms that make sense to either a fifteen month old, a fifteen year old, or someone with a degree in biology ( your choice of level) why a raven and dove are different kinds from each other, when a dog and a seal are the same kind, and so are a sugar glider and a Tasmanian wolf. You said it yourself. its about anatomical traits that clearly unite otherwise segregated populations. the raven and dove are mentioned in genesis as two kinds on the ark. The point being bird kinds are real and its not a single BirD KIND. so it must be that the traits that segregate a dove from a raven etc count as making kinds. Its always a option there is fluidity in a kIND that can lead to more kinds. yet there is no reason to likewise say a KIND was yet segregated into seals, bears, foxes, bear-dogs and a host more. These are one kind and so on the ark would only have a pair/or seven pairs. Its not easy to see why the dove/raven is so different but it was. Robert, thank you for responding promptly to my challenge, but it’s not much use if you then in your hurry ignore what I asked you to do. 😟 I asked you to explain the supposed distinction of kind between raven and dove, in contrast to the supposed single kind of marsupials, and the other supposed single kind of dogs, bears and seals, “WITHOUT RECOURSE TO THE BIBLE”. (I’ve added the capitals this time just to help this phrase draw your attention, since you missed it before. It’s in the final sentence of my last post, just after “So here’s the challenge, explain….”) So there’s no point in referring me to Genesis, and the separate specific reference to a raven and a dove in the story of the Ark. That, as we must all know perfectly well, is the ONLY reason why any person could ever have attempted to class them as different “kinds”, while simultaneously classing dogs and bears and seals, which the writer of the Ark narrative didn’t happen to mention specifically, as one and the same “kind”. As for the marsupials, of course, they are mentioned absolutely nowhere in the Bible, for the very good reason that none of the writers had the remotest conception of their existence, or that of the continents of South America and Australasia, where the creatures resided then as now. How COULD those people have, living in that place and at that time, unless this biological and geographical information had been miraculously imparted to them? Which, clearly, it wasn’t. We 21st century folk are better informed than them biologically and geographically, thanks to two to three thousand years’ worth of non miraculous human discoveries. Sadly, these discoveries, for YECs utterly committed to a literalist religious doctrine, can be nothing more than a stumbling block and a spur to wilder and wilder inventions and suppositions, nowhere stated or imagined by the Bible writers, in the doomed attempt to square the circle and reconcile the Bible passages with each other and with modern knowledge. Well said Sally. However, I if you’re still hoping that Robert will finally give a rational explanation for how doves and ravens can be more different than kangaroos and sugar gliders, I think there’s more chance that pigs will fly–even if he throws pigs into the same kind as birds. Oops! He’s really stepped in it now! That is a giant no-no thing to admit in YEC circles. Only the imagined boundaries of their ill-defined Genesis kinds allow them to claim that any changes we see are not really “evolution”. On the other hand, it may be one of the few things Robert may have a point about. After all, it’s possible to interpret the phrase “after their kind” in Genesis in a way that does not restrict how far kinds can change. It could be taken to just mean that God created a set of different “kinds” that bred with each other and not other kinds, but that each still had the capacity to change in essentially limitless ways as they adapted to new environments over time (in other words evolve, and in major ways). YECs seem to never consider that, even tho it is still in a sense “literal”–in the same way that the Hebrew word for day can literally mean a 24 hour day, a longer period of time, or an indefinite period of time (as it is used in other places in the OT, and even in various parts of Genesis), They also seem to never consider the implications of the verses in Genesis where God commanded “let the sea conceive and bring forth…” and “let the earth bring forth” living things. To me, that sounds more like an indirect creation (evolution) than direct and instant creation. Yet they insist on the latter, apparently unwilling to consider that they could be mistaken, despite all the fossil and geologic evidence for a long and complex earth history. Of course, not of this begins to account for how doves and ravens can be more different than all marsupials, whether using genetics, morphology, or any other criteria. its a far off option. in fact i only allow it because of the birds/ark example. i’m not sure. Since a KIND could adapt as needed to fill the earth then does this lead to NEW KINDS. Hmmm. Probably not but a option. Yet not by impossible selection on mutations plus time. All snakes came from a single kind on the ark. Yet the birds are a example . Besides contradicting yourself twice in 3 short sentences, you apparently don’t grasp the implications of what you are saying, or why other YECs would cringe at it. If natural selection acting on mutations overtime can create new kinds, they by any reasonable definition, that’s evolution (including macroevolution). “All snakes came from a single kind on the Ark” asserts Robert, with no attempt whatsoever to give a justification for this pronouncement, even in the form of a citation of a bible verse or verses. But Since there is no reference to snakes in the Noah narrative I guess you must be taking it that the serpent in the Garden of Eve narrative would have to have been the ancestor of all subsequent snakes (perhaps parthogenically since it is referred to as THE serpent as though it existed alone without a mate). What was its means of locomotion BEFORE God cursed it and it had to travel on its belly, do you think? The ancestors of snakes did indeed have legs, as can be seen from vestigial features in their anatomy, but losing them was not a punishment but an evolutionary advantageous development, just as it was for the slowworms, who separately underwent a similar evolution, although not implicated in the serpent’s supposed sin. Or do you want to lump slowworms in the same “kind” as snakes, and claim they are also this serpent’s descendants, rather than being lizards, as all zoologists would assert? BTW, neither snakes nor slow worms actually eat dust, though the equally legless, indeed boneless, earthworms do, very usefully for planetwide ecology. It would make a lot more sense, come to think of it, for you biblical literalists to argue that the serpent in the Eden narrative was actually an earthworm. 😁 Admittedly they are not given to biting humans on the heel. I did answer. Indeed saying a raven/dove are different kinds comes from genesis. to otherwise say so iS A OPTION. therefore its a need to understand why they are diffeent kinds. I have never studied the two birds genesis mentions. There might be great reasons to see them as different kinds and not a single BIRD kind. Yet this in no way discredits lumping other critters into kinds. Marsupials easily are the seen as the same kinds as other creatures with minor details of difference that affected a spectrum of migrants to certain areas. why not? How one classifys creatures must be on common , REAL, ideas of bodyplans. including the option for adaptation from a original parent bodyplan. So what A kind is can be figured out. the bird thing is a example, it seems, but the great and clear intellectual investigation will show creatures are so alike as to have a common descent THEN NO MORE. So yes bears, seals, marsupial wolves, lassie, are the same kind. this is clear or should be. Its a hypothesis and works for biblical creationism. Classification that evolutionists use is wrong, unlikely, and not as intellectually sharp. Have managed to figure out which placental mammals kangaroos are a version of? No, you’re just repeating what you said before, without answering Sally’s question about what makes them different kinds apart from Genesis. “There might be great reasons to see them as different kinds and not a single BIRD kind. There might be cows on Neptune too. If there are even good let alone great reasons, why can’t you give even one? We’ve already explained ‘why not.’ Apparently you haven’t grasped any of it. OK, then explain how kangaroos and sugar gliders have more similar body plans than doves and ravens. Actually, it makes no sense even by your own criteria (body plans). This is rich, since your claims contradict even what other YECs say about kinds, besides what anyone with eyes can see. As usual, your claims are so loopy and self-contradictory that it’s hard not to not wonder if you’re just a troll –maybe someone just trying to pull our legs or spoof YECism. If so you’ve got us, but let’s move on to serious discussions. Robert: “…Whats an expert? where is the experts? If there is a silver lining to all Robert’s claims, it may be that some are so absurd they can be entertaining at times, even though he apparently doesn’t mean them to be. Or does he? :^). (I’m still not entirely sure that he is not just trying to get a rise out of us). BTW, some time ago I responded to a Quora.com question asking “What is the most absurd thing you’ve ever heard a YEC claim” (or something to that effect). I replied that it might be Carl Baugh’s story (as told in his book Panorama of Creation) about some quarry workers in France, who in 1856 broke open a huge boulder. Baugh relates that to their amazement, out staggered a giant, black, oily pterodactyl, which fluttered its wings, gasped, then collapse at their feet. He noted that this find, which he described as definitely “credible” discredits geologist’s claims about deep time, since obviously the creature could not have been alive in the rock for millions of years. (Never mind that it could not have been alive in the rock for a few thousand years since the Flood either, or one hour or that matter). Anyway after all the interesting assertions Robert has made here and elsewhere, I may have to rethink my answer. I was interacting with an individual on a medically oriented blog recently (more my area) and after I and others (mostly others, as I ran out of time), answered a high volume of relatively unsophisticated questions, and addressed similarly naive assertions, I began to wonder if “the troll” was not an inventive student (amateur or formal). Present examples excepted, but I can picture some “trolls” being students, who have found a clever (sociopathic?) way to get a ton of free education from knowledgeable people. Definitely an evidence free theory. And not in any way a suggestion that the information/education being provided be restricted here or elsewhere. Just the most charitable theory of “trolls” I have come up with. Tom, It’s an interesting theory, and trolls come in all flavors. I had not considered that a student could use provocative claims to elicit lots of educational responses. Other trolls simply enjoy the rush of saying outrageous things and watching the reactions from others. However, to carry this on for long, they’d have to be pretty good actors, and in cases like Robert and other fringe-of-the fringe YECs such as Baugh, Juby, Hovind, and Brown, on balance think it’s more likely that they are simply at the far left of the graph in the Dunning-Kruger article. It is interesting that some people who regularly post in these blogs, including Joel, Christine, and Paul seem eager for new ideas and info from others, and freely admit when their knowledge about something is limited or could be wrong, despite their in-depth expertise in certain fields and wide knowledge in general, suggesting they are at the far right of the chart. @ Glen, re Dunning-Kruger. Ironically, it takes a lifetime of study in an area (to become an ‘expert’) to realise how little you actually know in your chosen field, let alone in other specialist areas. There does, however, appear to be a growing epidemic of the attitude ‘my opinion is as good as your expert knowledge’. Partially, I think, fueled by the ever increasing amount of information available at the touch of your fingertips. (Information, of course, is not the same as knowledge; and knowledge is not the same as wisdom). I believe you have the truth of it. And the willingness of everyone here to educate through the trolls’ comments is greatly appreciated (I will be thinking/reading on the carnivorous ungulate Christine’s comments introduced me to for a long time). In assigning Joel, Christine, and Paul as residents of the right side of the curve, I think you are being excessively modest by not placing yourself there as well. Time for me to work now. Me too. In retrospect, instead of saying that trolls come in all flavors, maybe I should have said that trolls and their comments come in all stripes. christine. Its all off thread. It seemed to me the conversation here was done. We all made our case, or i did as there is a lot of troll accusation and expert obediance demands, . The marsupial wolf is claimed by evolutionist to be a convergent evolution case. its a perfect match for wolves everywhere, save in minor details, but they say its of a marsupial family that evolved into bodyplans as elsewhere on the planet but not related. Its not claimed to be like a tiger. yes there was once marsupial cats. The stripes is irrelevant to anything about this. Anyways i think i did better on this discussion about biological classifications. No sour grapes folks. Just think and articulate better. To make a case, you need to do more than just float a lot of extreme and unsubstantiated claims; you need to provide actual evidence, as well as answer questions directly, rather than just repeating the same or outlandish claims or adding new ones. No one actually accused you of being a troll. I just speculated that you might be one as a possible explanation for your behavior. Nor did anyone demand you show “obedience” to experts. However, I think it was fair of me and others to urge you to be more receptive to the input and corrections of those who have more knowledge in biology, paleontology, and geology. Okay. It seemed like a troll spectrum was suggested or something. i offer my case on the evidence we are using here. I’m receptive to well done science not wrong stuff. you guys likewise be receptive to right and not wrong science. Somebody is wrong and so correction is probably difficult for the wrong guys. Yes i think there is a curve also in these matters and all human matters. Why can’t the right side persuade the wrong one? there was nothing wrong with the discussion here relative to a contention. The Natural Historian had a post some time ago about this topic. And your case is merely to deny any scientific evidence. Or, to use your own terminology, to refuse to obey the demands of the experts. Your ‘case’ is merely your opinion, based very loosely on Genesis in a few cases (e.g., dove versus raven), but mostly on looking at pictures in books and claiming that those animals look the same to you, thus they must be the same thing (note that neither Thylacinus nor Thoatherium are mentioned anywhere in the Bible). You are, of course, entitled to your opinion. Just be aware that it does not represent some sort of scientific counterpoint. It’s comments like that that led me to wonder if you are a troll. As we all know, you haven’t offered a shred of evidence for anything, or shown the slightest receptivity to evidence and corrections from others with more knowledge (which is almost everyone). Robert: “Somebody is wrong and so correction is probably difficult for the wrong guys. Yes i think there is a curve also in these matters and all human matters. Exactly. Although you haven’t provided any evidence, you have proved that you are on the far left of the Dunning-Kruger graph. That gives me little hope that you’ll take these comments to heart any more than you have in the past. So I’m not sure why I’m even writing this, other than try put some closure on things. If there is a silver lining to it all, it might be the possibility that some readers (even silent lurkers) here may have picked up a few things from the evidence and corrections offered by others when you make outlandish claims. Perhaps with time you’ll even let some of it sink in a little, but I’m not holding my breath. Robert: Why can’t the right side persuade the wrong one? Do you seriously believe you’re right and everyone else is wrong? The D-K effect may be working against you, but the first step in overcoming your ignorance is recognizing it. You should not even be trying to persuade anyone of anything until you first learn a few things. Again, that requires doing some serious reading and being receptive to input from others. If you’re unwilling or unable to do those things, then you’re not going to persuade anyone anything, other than confirming your position on the D-K chart. I was going to say, if that’s the case, please move along and stop wasting our time and yours. But I guess that’s a Catch-22: you won’t see that if you’re so clueless you don’t see how clueless you are. Maybe the solution is for us to just ignore you, or for Joel to consider blocking you. I doubt even other YECs would complain, since frankly, you’re an embarrassment to your own camp.